If you’ve been thinking about adopting a dog (or cat) but have been “waiting for the right time,” the right time just may be August 15! NBC 5 and Telemundo Chicago are hosting Clear the Shelters, along with 25 shelters in the Chicago area. One of those shelters is Orphans of the Storm®! If you adopt your dog or cat that day, the adoption fee will be waived (additional fees for shots may apply). There are plenty of deserving pooches ready to go home with you! 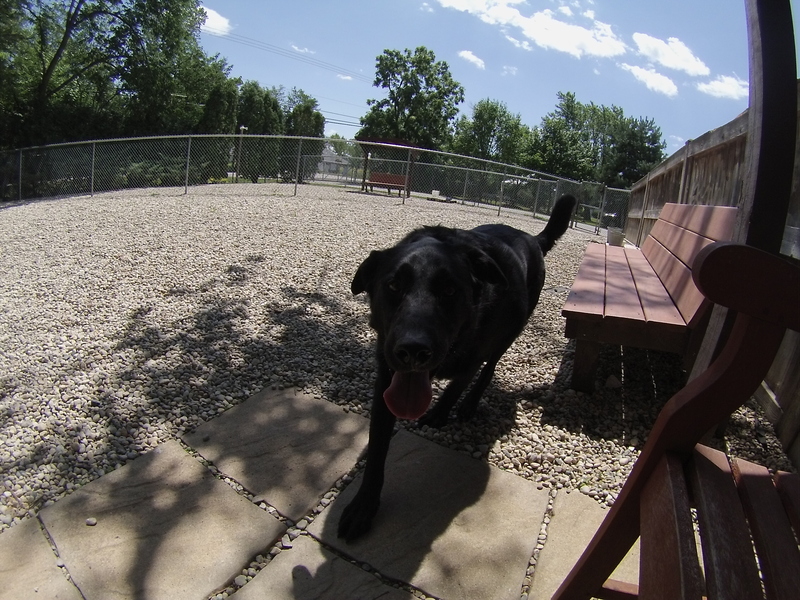 Chico the three-year-old Labrador Retriever mix is a fun and outgoing boy. 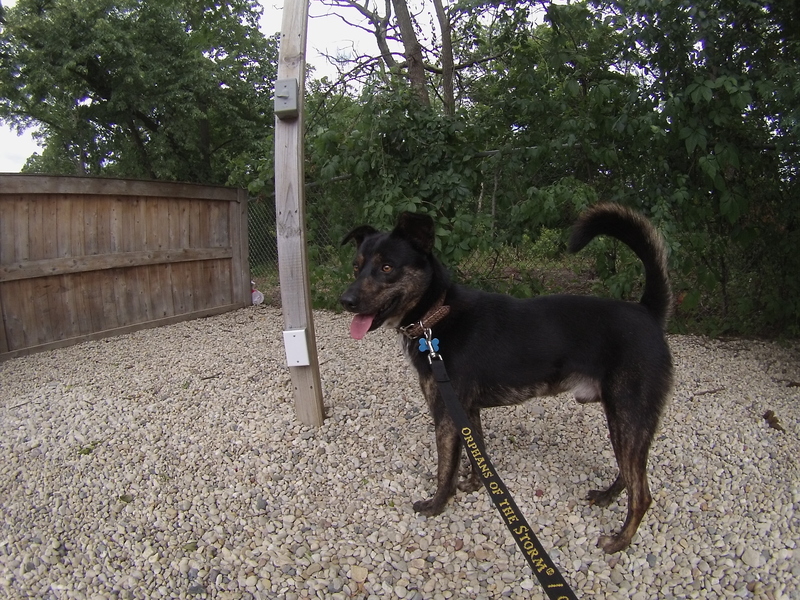 He loves to romp around, whether it’s going for a walk on-leash or exploring a yard off-leash. He’s attentive and likes to be kept in the loop–whenever somebody walked by on the other side of the fence, Chico would hurry over to see what was going on. Chico is also very handsome, with his black-and-white markings. 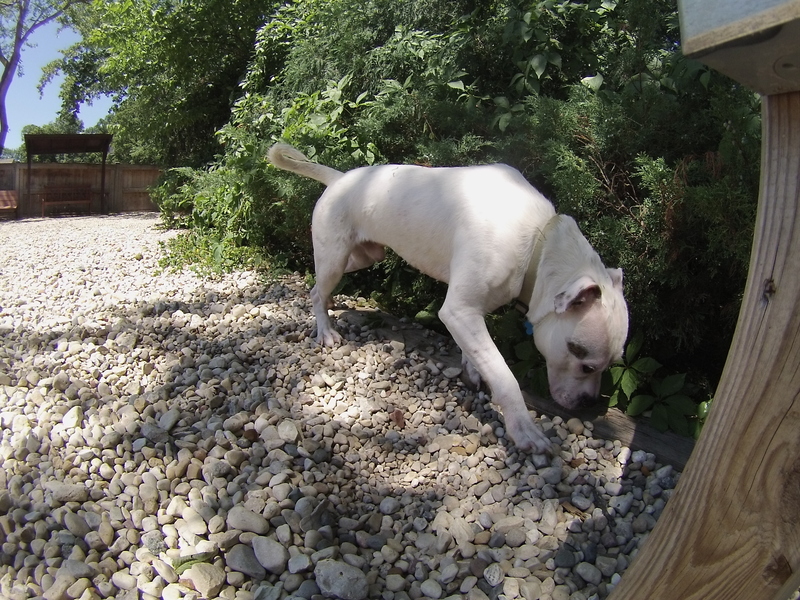 Chico gets along with both people and other dogs. He’s currently sharing his kennel with a Husky mix, so he could go to a home with or without another pooch. He also seemed politely interested in a little Spaniel mix who was in the run next to ours. If affection is what you’re looking for, Chico is here! When I sat down on the bench, he basically catapulted himself into my lap (as best he could, since he’s a big boy) and then happily stood next to me with his tail wagging. Stop by soon to meet Chico! 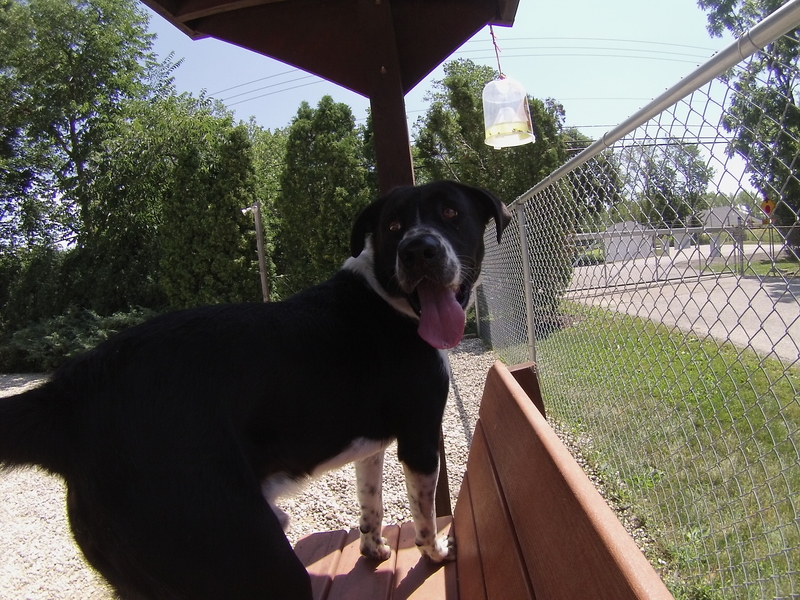 Razor the one-year-old Labrador Retriever/Mountain Cur mix was a little nervous when he first came out of his kennel. He kept his distance in the beginning (though not that much distance, since the leash was only a few feet long) and quietly sniffed and explored. But the more time we spent together, the more snuggly Razor became. Razor, after getting used to his surroundings, came over and leaned against my leg a little. When I started petting him, he flopped over for a belly rub and kicked his cute little puppy paws in the air. After that, we were good buddies and he stayed close to me. He was a little unsure of the bigger dog in the run next to us, but it was easy enough to distract him and have him follow me to the other side. Razor is looking for a new best friend. If you are too, come in soon to say hello! 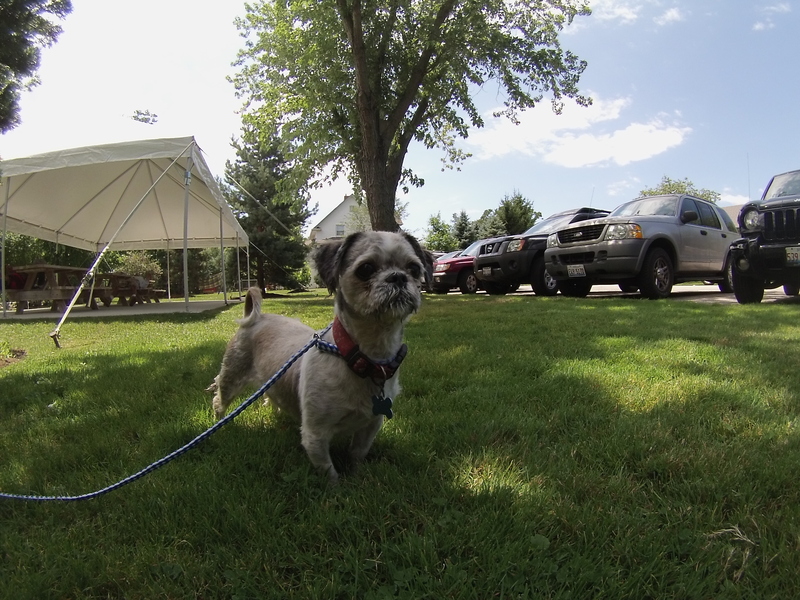 Rocky the eight-year-old Shih Tzu mix is super cute. He’s definitely one of those dogs who will elicit a lot of “Aww”s when he’s out and about. He has a buzz cut for the summer, which makes him extra soft to pet. Rocky is currently sharing his kennel with another dog closer to his size, so he could go to a home with or without another dog (though he does seem to have a bit of Little Dog Syndrome, trying to act tough when bigger dogs get close). Rocky is a dog who walks with a purpose. He trots around with his head held high as if he’s saying, “Look at me!” After we walked around for a bit, I sat down in the shade and Rocky plopped down next to me. Although I personally didn’t try picking him up, another volunteer did when putting Rocky back in his kennel and Rocky was fine with it. If you’re looking for an adorable little companion, stop by soon to meet Rocky! Chica the three-year-old black Labrador Retriever mix is a big girl with plenty of energy when she first gets out of her kennel, but don’t let that deter you. Once she gets the chance to stretch her legs for a few minutes, she’ll be ready to sit down and shower you with doggy kisses. 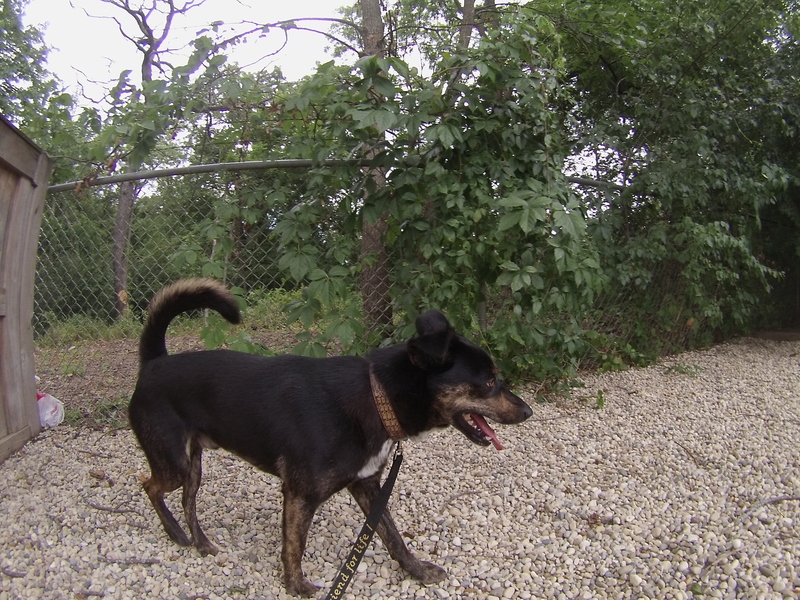 Chica would be a great buddy for someone who likes to take long walks. Chica is very fond of people, but not so fond of other dogs. She’d do best as the only dog in her new home, but when you have a dog as affectionate as Chica, you won’t be missing out! Half the pictures I took of Chica are a close-up of her nose because she always wanted to be right next to me. When I sat down on the bench, she quickly trotted over and stood by my side so I could pet her. 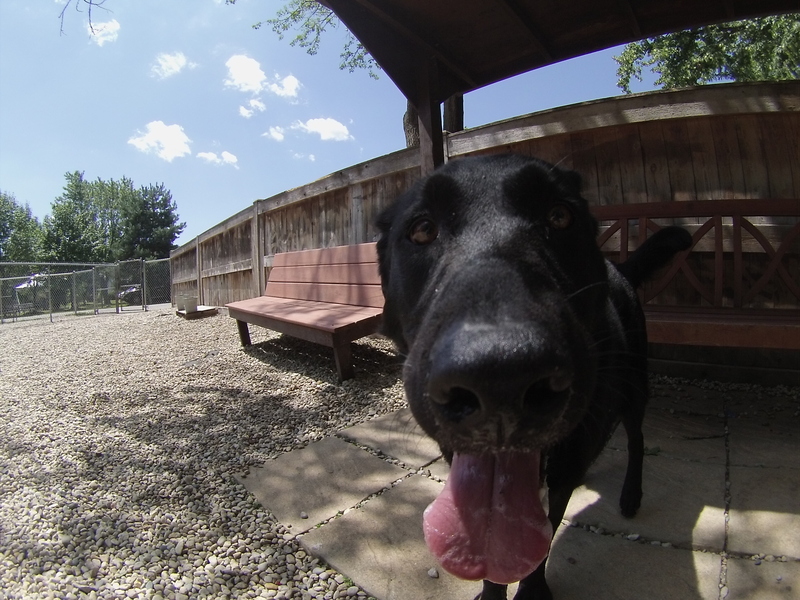 Don’t let Black Dog Syndrome keep Chica at the shelter for too long! 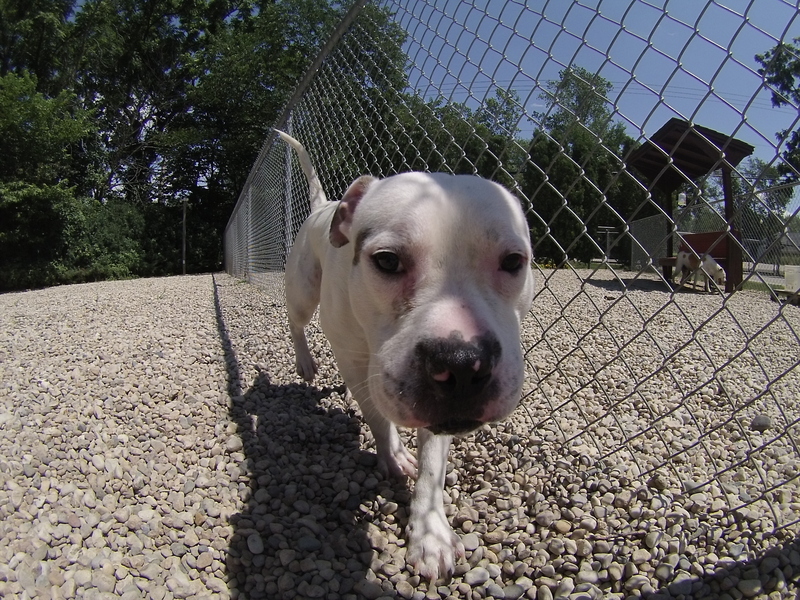 On your next visit, be sure to say hi to this sweet girl. Alfred the one-year-old American Bulldog mix is a perfect example of why you can’t judge a dog from inside their kennel. Since he’s new to the shelter and probably overwhelmed, he’s very nervous when he’s inside his kennel and didn’t want to sniff my hand when I first walked by. But as soon as he was outside and walking on the leash, all he wanted to do was cuddle! Alfred has a super cute face with just a couple brown spots, while the rest of him is white. His tail starts wagging as soon as you start petting him, and he also wagged his tail in a friendly way when he greeted a dog on the other side of the fence. He loves getting scratched on his back by his hips and will do a cute little dance while you do that. Alfred just needs to learn that the world isn’t a scary place, and being adopted into a loving home is sure to teach him that. Come in soon to meet Alfred! I also saw Bear, Blush, Cooper, Courage, Diamond, Jasmine, Jessica, John Boy, Lady, Lexi, Skippy, Tiger, Zoey, and Zola (also known as Chola). 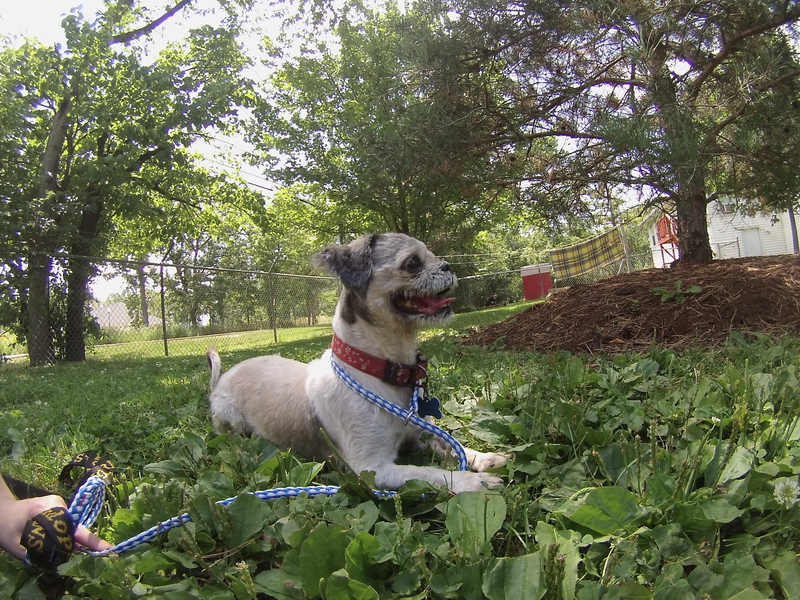 Posted by Meet the Pooches on August 6, 2015 in Dog Profiles and tagged adopt, adoption, American Bulldog, animal shelter, animals, Chicago, Clear the Shelters, Deerfield, dogs, Labrador Retriever, Mountain Cur, Orphans of the Storm, pets, Riverwoods, Shih Tzu. Why don’t you ever concentrate and take pictures of and try to get adopted the dogs that have been there for years? Hi Lisa, thanks for reading and commenting. There have been posts written about all of the long-timers at the shelter, and some (like Shamrock, who is the shelter’s longest resident) have been written about multiple times with updated photos. All of the dogs profiled can be found listed on the “Dog Profiles” page. Although I don’t take new pictures of them each week, I do spend time with some of the dogs who have been there for an extended period of time (such as Blush) on each visit to the shelter. If you look at the end of most posts, there is a list of other dogs who have previously been written about with links to their specific posts. We absolutely want to find homes for all of our long-timers!